I saw the sun for the first time at 8 am on a Sunday since maybe forever (where college == forever), and walked over to N52 to load the go kart onto the U-Haul and get ready for the first competition: the drag race. This wasn’t really the race Nelson and I expected to do exceedingly well on given our motor, but it was still exciting. From the glimpse I got of the score sheet, our record was around 10.7 seconds for the 50 m race. Not too shabby, if I say so myself. As you can probably tell, the goal was to be closer to the dark blue line than the black line. We were able to snag the lowest energy consumed, but our speed was a tad slower than a couple of other runs from other teams. 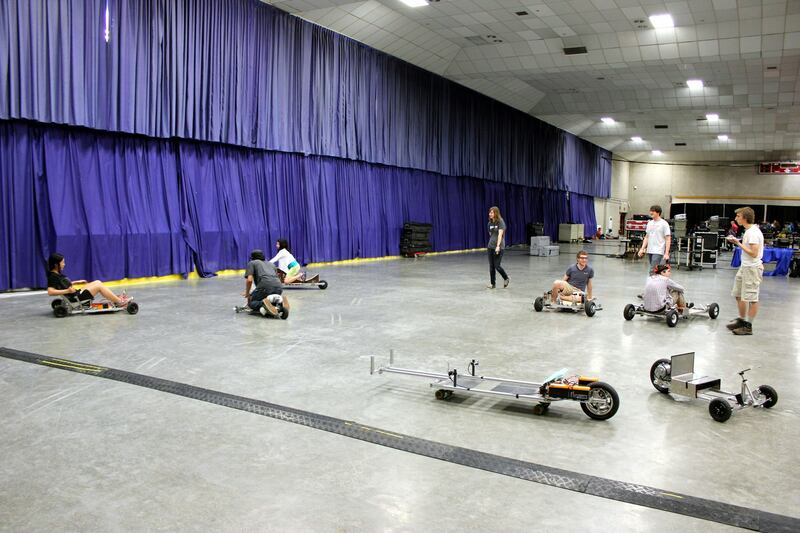 So, the competition is over, and the only thing left was presenting our karts at the 2.007 robot competition. It seemed to be a huge hit (especially with young children…). Here’s a picture of all of us on our go karts! No children were harmed over the course of the night. Thank God.